First Line: The man was sitting on a bench in the reception room when Miles Vollner came back from lunch that Wednesday afternoon. There are two investigations for the 87th Precinct, and one of them is a hot one. Stan Gifford, possibly the country's most beloved comedian, has died on-air in front of forty million television viewers, and it's up to Steve Carella to find the killer. The second investigation involves Cindy Forrest, a young woman who's working to put herself through college. After an incident at her place of employment, the 87th Precinct's Bert Kling sees that Cindy is in grave danger, and his superior officer assigns him the task of being the young woman's bodyguard. There's only one problem: Cindy can't stand Bert Kling and doesn't want him anywhere near her. In other words, it's just another day in the 87th Precinct. Ed McBain has always been one of those crime fiction writers that I said I'd get around to reading "one of these days." Well, the day finally came, and now I know what everyone's been talking about. Eighty Million Eyes (forty million viewers times two eyes each...) is a lean, mean fighting machine. No fluff. No lengthy descriptive passages. No character contemplating his or her navel. Two major plots. No subplots. This could be the recipe for something excruciatingly boring for a reader like me who likes character-driven plots and strong settings, but it most certainly isn't because Ed McBain was a master of his craft. Written in 1966, there are no gun-toting CSI folks spraying everything down in luminol or running DNA tests, but you'd be amazed at the amount of evidence that can be found by good, dedicated detectives with sharp eyes-- detectives who have to track down a payphone in order to call the precinct. I do enjoy the science in modern crime fiction, but reading something like this from back in "the Stone Age" can be quite refreshing. This is around the twentieth book in this series, and although it's the first I've read, I didn't feel as though I'd been dropped on my head in the middle of the story. 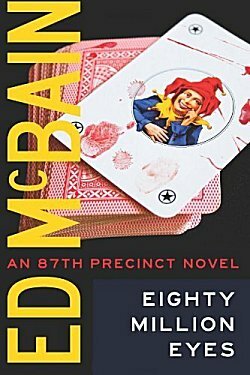 McBain's lean prose style brought this big city to life, I got to know some first-rate detectives, and I read a couple of scenes where my blood ran cold. This author pulls you right into the story. I want to thank the person who finally nudged me through the door of the 87th Precinct. As Arnie would say, "I'll be back!" I'm so glad you liked your first visit to the 87th, Cathy. I think this is a terrific series, and the characters well-written. I know that everyone has a lot on the TBR. But if you do get the chance to go back and read the series in order, you'll get a good sense of some of the story arcs, too. Thanks for the tip, Margo! I've never read or been drawn to McBain's books, but since you liked this book and also are a fan of character development, I may give it a try. I'm reading Michael Connelly's latest book, "Two Kinds of Truth," very good.